Kumar India Tours offering 9+1 and 11+1 Seater Deluxe 1x1 Tempo Travellers hire from Delhi to Outstations with Drivers, Its Best for Big Family to Enjoy tour Packages. Party Tour Packages with Tempo Travellers from delhi to Shimla Manali, Agra, Mathura Vrindavan, Jaipur, Rajasthan and Haridwar Rishikesh, Jim Corbett, Nainital, Mussoorie, Golden Triangle Tour by Tempo Traveller, Delhi Agra Jaipur Tour by Deluxe Tempo Traveller, Varanasi Tour by Deluxe Tempo Traveller, Khajuraho Tour by Deluxe Tempo Traveller, Delhi Local Tour by Deluxe Tempo Traveller, Dharamshala Dalhousie, Katra Vaishno Devi Yatra Tour by Deluxe 1x1 Tempo Traveller Hire in Delhi. 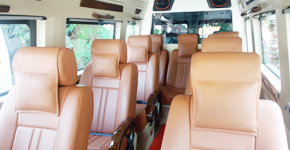 9 seater deluxe 1x1 tempo traveller price in delhi, maharaja 1x1 tempo traveller hire in Delhi, rent deluxe tempo traveller in Delhi, 11+1 Deluxe 1x1 Tempo Traveller in Delhi.